Wasn't my first show, and not close to my last. Just got tickets for the 40th Annv. tour. My greatest memory from this show was that after Starship Trooper, the fans had the lighters going looking for another song. The house lights came on. Now when most would douse the flame and start making their way to an exit; no one moved. It got louder, and then in a moment the house lights were killed and it was the loudest reaction I have ever heard from a crowd. We were then treated to the obvious finale. The harp, the fog, the lazer... great tour. 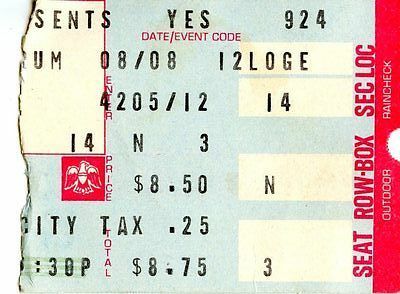 I had just graduated high school and this was my first Yes show although I'd seen Rick's Journey to the Center of the Earth at the Garden a couple years earlier. After finding our seats we walked around and checked out the roadies putting the finishing touches on the stage. They must've been doing an adjustment on the mains cuz I remember them lowering the entire flying gantry where row upon row of Phase Linear power amps were located. After a few moments of tinkering, the whole thing was set in motion by the chain hoists and up it went. We also noticed that Alan White has a really strange drum kit with toms that had curved bells on them - kindof like a cross between a regular tom and an alpenhorn. I later found out these were North toms when I saw them in a music store closer to home. Like clear drums and mirrored pianos, I never saw these things once the 80's rolled around. Wakeman's keyboard arsenal took up well over a third of the stage. In addition to the perfuntory Hammond c-3, Steinway grand and Minimoogs he also had a portable pipe organ and the new (for 1977) Birotron. We briefly caught sight of Wakeman tuning up and testing out all the his electronica for a few minutes before the start, but no one in the audience seemed to recognize him. Donovan warmed up and, apart from a serviceable rendition of 'Mellow Yellow', the set was not particularly memorable. Yes led off with 'Parallels' (my favorite cut on Going for the one) and that really kicked things off for me. The setlist is detailed elsewhere on the site and the only two that are memorable now are Close to the Edge and Awaken. On the center section of close to the edge (I get up I get down) they flooded the stage with dry ice fog and bounced a green laser into a mirrored ball hidden behind a banner located over center stage directly downward into the fog. The visual effect of the green pencils dancing thru the fog with the already trancelike quality of this passage was really spellbinding. I was a bit of a musical purist at the time so I was (unlike many of the other audience members) completely 'unaltered' at the time (just in case you're wondering). Awaken (and actually all of the Going for the One material) was very fresh and you could tell they were really enjoying showing it off. Jon got up on a riser to play the harp interlude in the middle and Chris as I recall at one point was playing a 3-necked bass (another one of those 70's oddities never to be seen again). Overall a very good show, but having seen them several times since, can't help but wish I'd caught them during the 72-74 period when they were really in full flower. I went to both of [the] New Haven shows. I was about 13 years old at the time, I went there with my older brother and it was the first concerts I had ever been to. I was young, impressionable, and completely into the sounds and sights of YES music. I remember Jon Anderson, perched on a chair, almost as if he was floating, playing the harp. Awaken was the song, I think, and the green lasers were split into a million beams around the crowd and it was soething I will never forget.